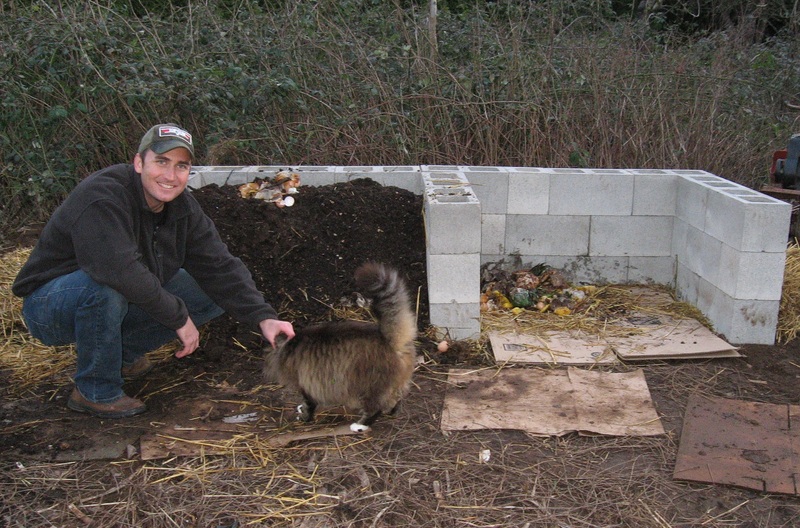 After checking out all of the different composting ideas with the local Master Composter Program, this one was my favorite. I’ve made a compost rotator, a moveable bin, and a worm bin, but was looking for a better alternative that was affordable, and that my readers (you) could easily duplicate. This design has 2 areas for compost however only one is used at a time. When you go to rotate the pile, you simply pitch fork it into the empty area. It’s that easy. The compost material that was on the top of the pile will now be on the bottom and ensures that all of the material is getting oxygen during the breakdown process. The tarp is to prevent the pile from getting too much water. Here in Washington this is essential as it rains quite frequently. This design cost me approximately $45 in materials. 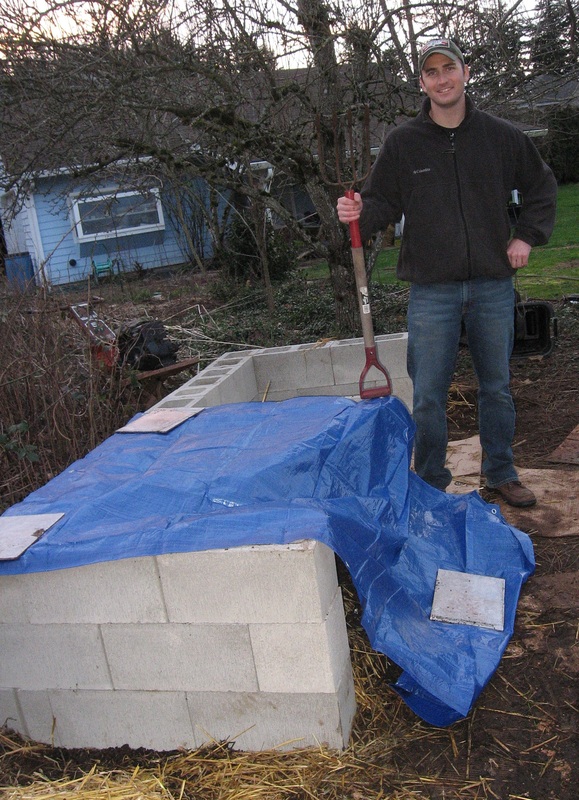 I used 34 (8 X 8 X 16) cinder blocks, 7 (8 X 8 X 8) cinder block halves, and a 5’ X 7’ tarp. The layers of cardboard beneath the pile will act as a barrier to keep weeds from coming up underneath. Try to have a ratio of 50% carbon rich “brown” material (I use dried leaves and hay) and 50% nitrogen rich “green” material (I use food scraps, fresh grass clippings, and manure). For the best results alternate layers of each type of material throughout the pile. If you are using Black Soldier Fly Larvae or Redworms you can add them directly to this pile. Note Redworms will likely appear in the pile on their own without you having to purchase/add them. You can then feed these critters to your chickens, fish, or other animals. I’ll include photos with the compost thermometer at a later date to show how hot it gets. 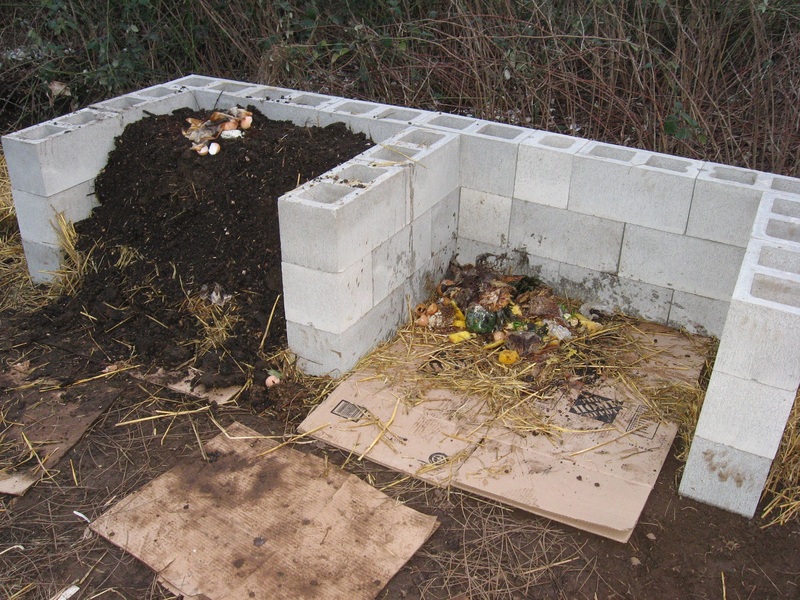 Composting is the natural process of turning organic matter back into high quality soil. According to the Master Composting Program Clark County produces 250,000 tons of waste each year. 40% of this is organic materials (mainly lumber). This 40% equates to 90,000 tons that could be reused here in the country. This saves the city money as they don’t have to pay to transport that material and it can be converted back into a useable product; mulch/compost. Chicken manure should be composted for at least 6 months. If weed seeds are present in your compost material they may germinate if your pile doesn’t get hot enough. 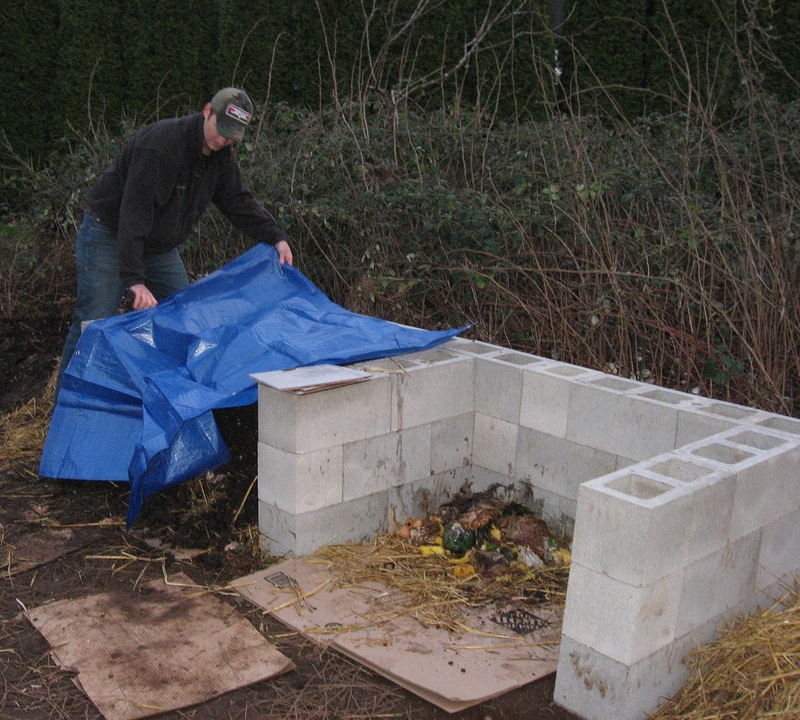 It is recommended that you get your compost up to 160 degrees for 6 hours on 3 different occasions to kill off pathogens (especially stuff like chicken manure). Rabbit manure however can be applied directly to your garden. A good rule of thumb is to rotate your pile every 5 days. Will you still need several of these stations? The way I imagine the process, is that one pile is being rotated and built upon with fresh material, while a compost bin somewhere else is at a stage in its life where it is ready to be applied to a garden right now. Is this correct? You could do it with multiple stations, or just make your one station bigger and time your utilization with gardening season. I located this one right by the animals, this cuts down the distance I have to carry the rabbit and chicken poop. It also allows me to throw any food scraps the animals don’t want directly into the compost bin cutting down on the trips I have to take through my yard. Lastly I can pull worms and black soldier fly larvae from the compost pile and throw them into the cage. Once I have a bigger property I will likely set up several of these stations, one near each animal pen.